Mine laying is relatively simple and cost-effective, their clearance, however, presents a great challenge for the „clearer“. Dangerous mine fields left behind, rarely mapped, extensively used untargeted and this particularly often in areas of civilian life present a lot of problems after conflicts. Usually, different types of mines are laid miscellaneously so that mine clearing devices can not simply drive into an area of presumed anti-personnel mines and in turn human mine clearers can safely disarm anti tank mines which can usually not be triggered by the weight of a human being. As the important thing when clearing mines in civilian areas is the complete and definite destruction of the presumed mines, thorough mine clearing has top priority. The technology used in the military sector has been developed for the fast way through a mine field and shall allow troops to quickly progress. But due care is neglected. The clearing vehicles offered by PKI are optimally arranged according to the customer-specific requirements regarding the existing problem. 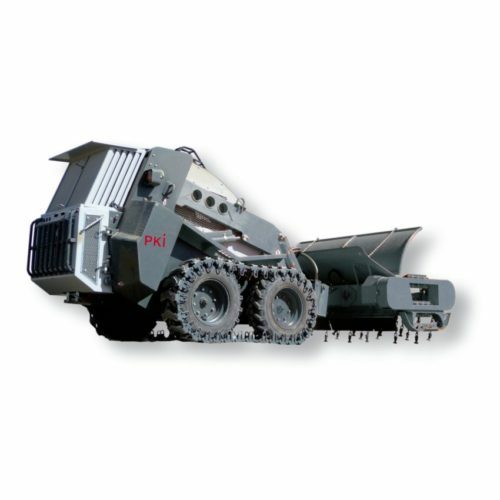 Our modular concept allows to equip the different carrier vehicles (wheel / chain drive / mixed) with different clearing tools (rolls, rotary cutters, chains, etc.) and thus to gain an optimal result for the prevailing situation. Whether manually, semi-automatic or completely remote-controlled units shall be used totally depends on the local conditions. A small-size clearing device can e.g. completely clear surfaces of up to 2500 m² per hour depending on the terrain. Equipped with classical hydraulics (Bosch Rexroth) and engine Deutz), maintenance and repair are no problem for a good truck workshop.